When fielded, take control of an opposing character. At the end of the turn, knock out that character (place it in your opponent’s prep area); it deals damage equal to its attack to your opponent. If Loki's ability is used, taking control of an opposing character die, any applied attack bonuses would be added to the damage dealt to the opponent. For example, the Invulnerability global ability would increase the damage by 1 ("Pay . One target character gets +1A (until the end of the turn)"). The added attack value be part of the character's stats when Loki's effect is applied at end of turn. End of turn effects can't be sequenced, they're simultaneous. If Loki controls and character and its damage is increased, it all resolved simultaneously at the end of turn. 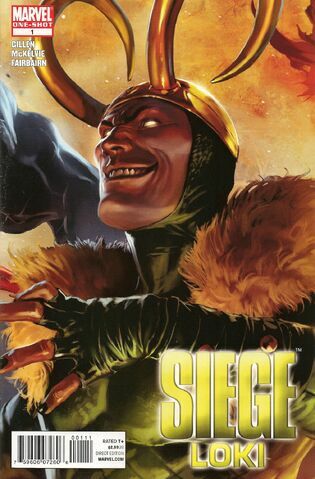 ^ Siege: Loki Vol 1 1. Marvel Wikia Database. Retrieved 20 July 2015.